The great under- or, better, un-covered story of the year: Cardholder Services and the Do Not Call Registry. You don’t know what I’m talking about? That’s because you don’t work at home. George W. Bush’s administration invaded Iraq and let Bernie Madoff run wild; but to its credit, it established the Do Not Call Registry to block telemarketers from flooding our telephones with unwanted offers. After I registered my phone number on the Federal Trade Commission’s web site in 2004, the phone calls virtually stopped. Salem, Oregon. 503-902-8252. Complaints about this number are all over the web. So the Obama administration has not followed through on the one thing that the Bush administration did right. The Federal Trade Commission filed complaints on Thursday against two companies that were behind an automated telemarketing campaign that enraged Senator Charles E. Schumer and, authorities say, deceived thousands of people across the country. 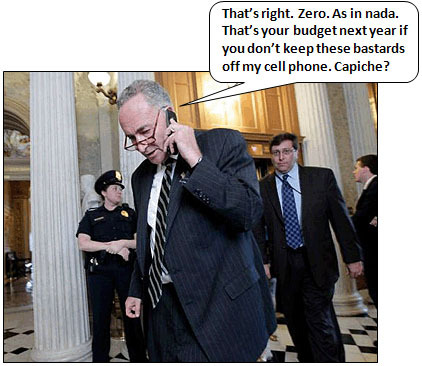 Mr. Schumer, Democrat of New York, was in a meeting on Capitol Hill last week when he picked up his cellphone, triggering a phony, prerecorded sales pitch, ostensibly for an extended vehicle warranty. Did you get that? 30,000 Americans had already complained about these calls and the FTC did bupkis. They obviously Do Not Care about ordinary non-powerful Americans like you and me and 29,998 others. But then Chuck Schumer got one call on his cell phone, called a press conference, and probably threatened the FTC with complete defunding if they didn’t shut down the bastards tomorrow. And guess what? The FTC shut the bastards down. The moral of the story here is that the FTC may not care about us ordinary schlubs, but they do care about pissed-off senators. So I recommend that Judis make a recording of the Cardholder Services robocall, get the private cell phone number of some senator (he must have contacts that can help him with this), and then call the senator and play back the call. Voila! A high-level complaint will be registered from one of the princes of Washington, and the FTC will spring into action.